Our quick-drying solution is specially formulated to be gentle on your One Two Lash® and your eye area. Cleanse your lashes AND remove your eye makeup in seconds. DIRECTIONS: Gently remove One Two Lash® (do not pull — rather, shift the lashes to separate), then place them on a clean surface. Apply a liberal amount of One Two Wash onto a cotton ball or tissue paper, then blot against your One Two Lash® to remove oil, buildup, and makeup. When you’re done, place One Two Lash® inside the One Two Case for storage until your next use. Why do I need a special cleanser? If you clean your lashes with a solution that’s not specifically made for One Two Lashes®, you run the risk of damaging both the fibers and the magnetic strip (which could leave your lashes unusable). Fortunately, One Two Wash is specially formulated to clean One Two Lash® products, while preserving their unique design — so your lashes look fresh, and work like they’re supposed to, for as long as possible. In fact, not only is One Two Wash the only cleaning solution that’s proven safe for One Two Lashes®, its nourishing ingredients can actually help to extend their lifespan, so you get maximum wear out of every set. How do I use One Two Wash? After removing your lashes, simply apply the solution to a tissue or cotton ball and gently dab each strip to remove residue. Once your lashes are clean, place them back into your One Two Case for safekeeping. Repeat after every use. We expect only the best and we know you do as well. 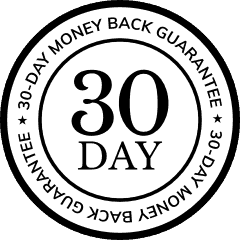 If for any reason you are unsatisfied with your purchase, we are happy to refund your money or exchange if returned within 30 days. Once lashes are received, we will then refund your order and will send out a confirmation email. Any questions regarding your purchase please contact us.